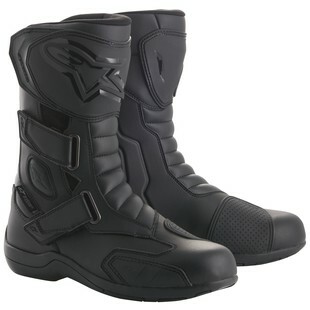 The Alpinestars Radon Drystars Boots are an exciting addition to the touring lineup from Alpinestars. One of the largest visual differences to the boot is the addition of a TPU Shin Plate offering more shin protection than seen on previous Alpinestars touring boots. There has also been a noticeable update to the TPR design on the outer edge of the toe box allowing for more flexibility and added abrasion protection. If we dive deeper into the features of the Radon it will be using Alpinestars Drystar waterproof membrane to keep you dry in less than ideal conditions. Coupled with internal toe box and heel protection the Radon will be just as protective as it is comfortable. All in all the Alpinestars Radon Drystars Boots are set to be a solid waterproof boot, perfect for long rides in any condition.